Some ti mes you want to be able to look at two documents at the same time. Perhaps you are referring to one document, whilst updating another. In this Blog, we show you how to view documents side by side in both Word and Excel.In Word or excel 2010, go to the View tab and from the Window group select View Side by Side. If you have more than two documents open, the Compare Side by Side dialogue box will open, listing all the other documents you have open. Select the document you want to compare and click OK. Both documents will now be displayed side by side. 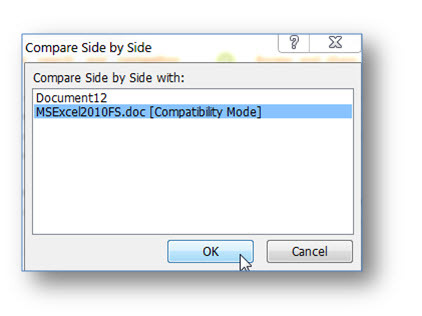 In Word the documents are displayed in Portrait and in Excel they are displayed in Landscape. Synchronised scrolling will automatically be set. 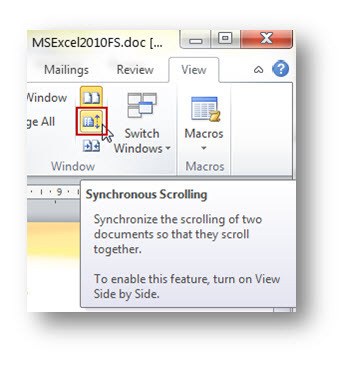 This means that as you scroll down one of your documents, the other document will scroll down at the same time. If you don’t want synchronised scrolling, simply click on the Synchronised Scrolling button in the Window group of the View tab.